The Swamp Where Gator Hides takes kids on a little journey with a gator. 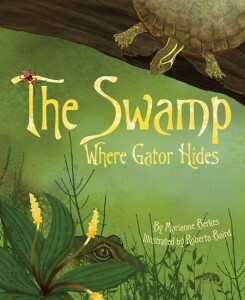 It takes place in the Florida Everglades, giving children an idea of the types of life they may find in the swamp. Gator is hungry, and while the reader wonders what he will make his meal, the story finishes without him actually eating anything. This book provides a look at nature and the habits of gators. There isn’t anything in it that vegetarian families should object to, despite the gator’s prey being discussed. It’s a nice book that has been beautifully illustrated and would make a good addition to any child’s book collection. Dawn Publications provided a review copy.